We love to brag about our customers especially when they are as cool as Joe Keller! Keller is the writer and director of the new short film Artifacts which is premiering at the Neighborhood Theater Saturday, January 15 at 2 pm. 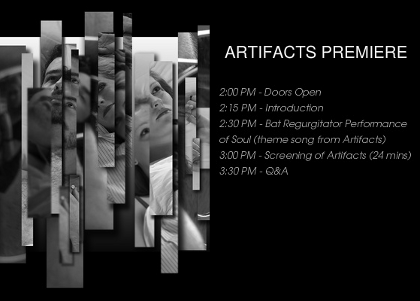 Special guests Bat Regurgitator will be on hand to perform Soul, the theme song from the film. Check out the trailer for Artifacts on YouTube to get you pumped to see the short film! For more information visit the Artifacts website. It is full of behind the scenes info, cast and crew listings and trailers! I highly recommend that you make it out to support this wonderful up-and-coming filmmaker! Go ‘head Joe! I had no idea he was into that! Looks interesting. Thanks for the heads up Shawn!! !